Be the first to share your favorite memory, photo or story of Sharon . This memorial page is dedicated for family, friends and future generations to celebrate the life of their loved one. Sharon at devoted Wife, Mother, and Grandmother. She was a staple at St. Patrick’s Day, fun loving, kind to everyone, and a friend to all. She loved baking, gardening, and spending time with her grandchildren and great grandchildren along with her many many friends. 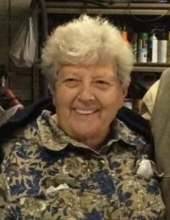 She was a member of St. Mary’s Church, Choir, and Altar and Rosary Society, a Girl Scout Leader, Cub Scout Den Mother, Utica Firemens Matches, Utica Garden Club, Red Hats, Junior Women’s Club, and Room Mother. To send flowers or a remembrance gift to the family of Sharon Ann Doerr, please visit our Tribute Store. "Email Address" would like to share the life celebration of Sharon Ann Doerr. Click on the "link" to go to share a favorite memory or leave a condolence message for the family.